There are many magicians but very few masters in magic. 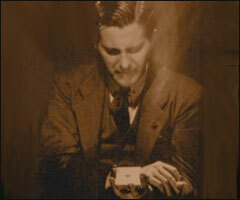 Dai Vernon was above all a master. 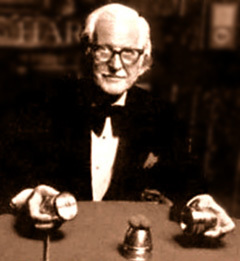 The professor, as he was known around the World was the man who changed the face of modern magic and reinvented close up magic. I first met Dai when I joined the Magic Castle in Hollywood. He was every inch the master when you saw him holding court in a corner of the Castle with a brandy in a snifter, a cigarette in the ashtray and a deck of cards in his hand. Magicians would discretely shadow him for hours just to add a little touch or move from his endless store of wisdom. Dai was very subtle, nothing he did was flashy or “show-offy”, it was just right. For any situation that might present itself during a card trick the professor had at least half a dozen ways to get where he wanted to go. Some of the greatest books of sleight of hand routines can be traced directly to his fertile mind. He was also generous and a true gentleman. In spite of the fact that I have always made my living performing comedy magic I have a guilty secret, I am also a first rate sleight of hand magician, shh, don’t tell anyone! However to me the mark of a true magician is to appear not to be doing anything other than watching the magic happen. My greatest joy is to find a move that works perfectly and then find a way to make it look like nothing is happening. Dai was a fan of my magic but deeply suspicious of the laughs my show created in audiences, to him anything that wasn’t magic was unnecessary and indeed a detraction from a magic show. Dai kept asking me why did I feel the need to make people laugh and in honesty it was a good question. I learned a great deal from the ‘spirit’ of Dai, he was unique and a true living legend, in a world where everyone thinks they are legends. In spite of his disregard for comedy Dai gave me a comedy line once: “When you lick the envelope to steal it say I will seal this envelope in this unsanitary manner. There is a long list of people Dai gave ‘moves’ to but I was always pleased at him giving me a line for the show and used it proudly. Sometimes late at night after the Castle closed I would take Dai for a late night supermarket run to the all night Hughes market in Hollywood, I would push the cart and he would throw some groceries into it, then I would drive him home and carry the grocery bags to his door. I always enjoyed these late night runs, it was fun to spend time alone with the great man and watch him choose between brands of dishwashing liquids. It made the legend into a real life person. Here’s to the great perfector, if there is a heaven, I know Dai will be in a corner of it with a brandy in a snifter, a cigarette in an ashtray and a deck of cards in his hand. ~ by Nick Lewin on January 8, 2013.